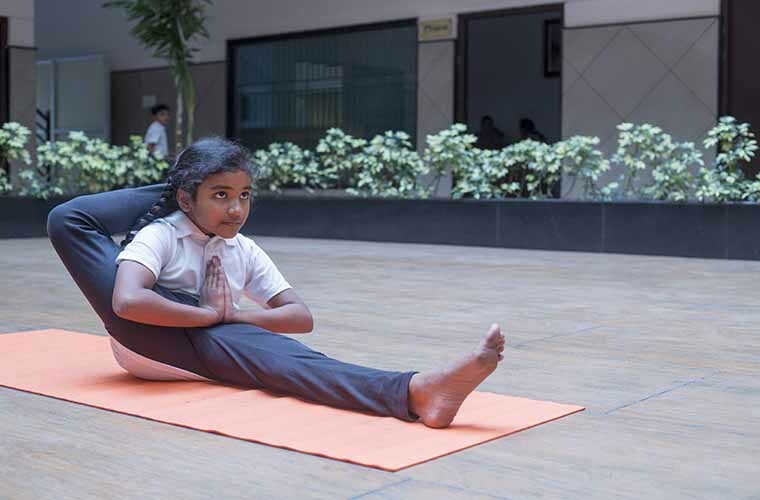 Agasthya Vidyanikethan realises that Yoga is not just an exercise. It is a process and system through which human beings can attain their highest possible potential. Yoga means to move towards an experiential reality where one knows the ultimate nature of the existence and the way it is made. Right through the history of this culture, sages and seers have been the very embodiment of knowing. The highest level of mathematics, the most profound sense of music, astronomy or medicine, everything came from sages and seers and yoga has had a major role to play throughout our civilisation. Long before the UN declared 21st June as the International Yoga Day, the land of Bharat was seen as a source of the spiritual sciences. For many millennia, yogis have travelled across the world, spreading these tools for wellbeing. People also have travelled to the subcontinent, to quench their spiritual thirst. The sacredness of a sporting event is that individuals rise beyond their limitations. 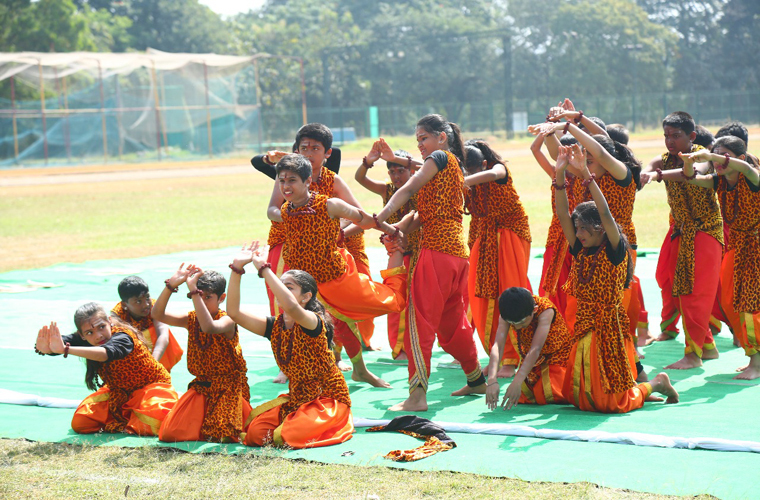 Thus, sports have always been a part of Agasthya Vidyanikethan, all our programs have an element of play – as to play is to live, and to live is to play. Swami Vivekananda went to the extent of saying, “In kicking a ball or playing a game, you are much closer to the Divine than you will ever be in prayer.” You never play a game to lose, you always play a game to win, but participation is important. If you maintain this fundamental with every aspect of life, you are a sport. And that’s all the world expects from you, that you are a sport. 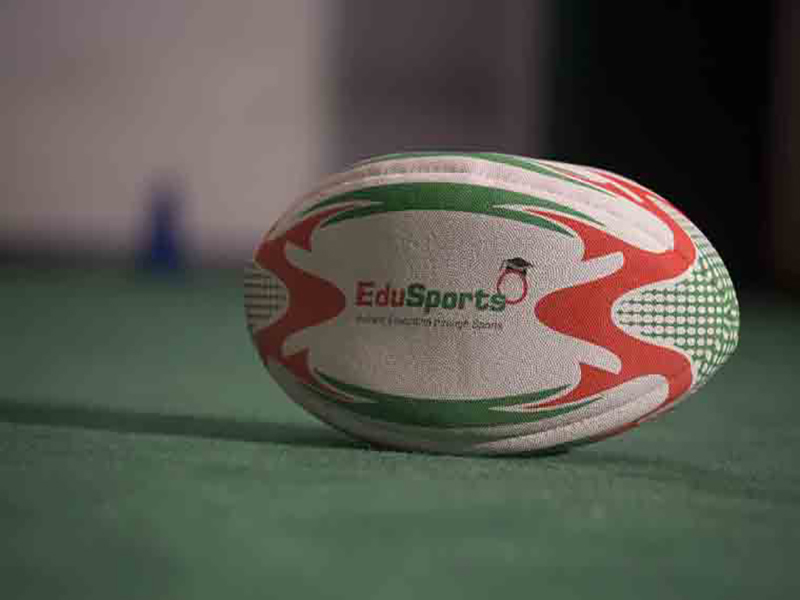 Bringing sport into one’s daily life boosts not only health, but happiness and wellbeing on every level. At Agasthya Vidyanikethan, we have any Indoor play area and an outdoor play area to help enable children of all age groups enjoy sports under all climatic conditions. Chess as a game has always contributed towards producing individuals with high IQ and critical thinking abilities. Since the brain works like a machine, it needs exercise like any bicep or quad to be healthy and ward off injury. Many studies have found that unused brain tissue leads to a loss of brain power. Chess exercises both left and right hemispheres of the brain and hence contributes towards overall brain development. Since the right hemisphere of the brain is responsible for creativity, it should come as no surprise that activating the right side of your brain helps develop your creative side. Specifically, chess greatly increases originality. It helps students to enhance their memory usage. A chess match is like one big puzzle that needs solving, and solving on the fly, because the opponent is constantly changing his/her strategy. 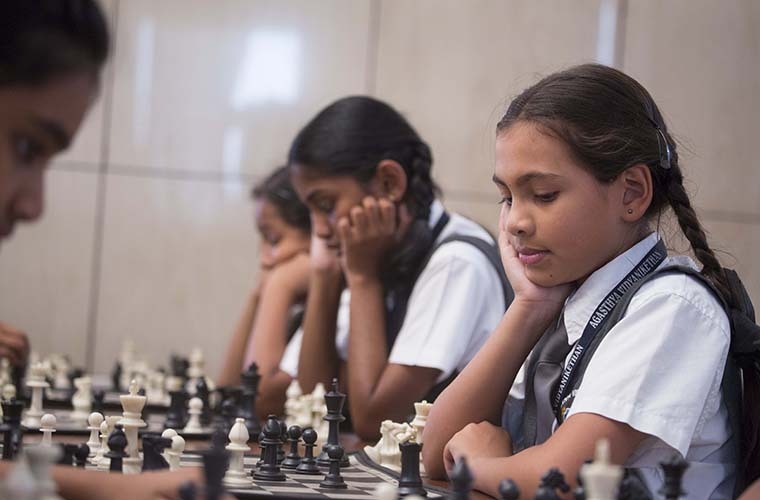 Chess teaches students planning, foresight, improves concentration, reading skills and problem solving skills. 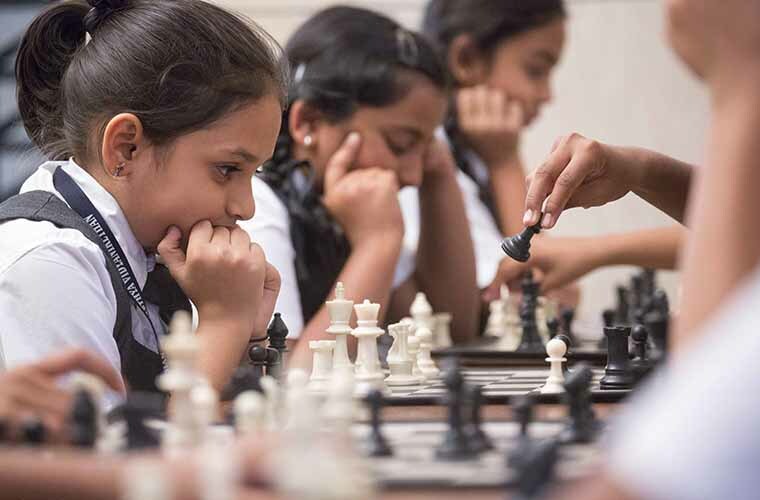 Realising all these benefits, it is Mr. Manjunath Aradhya’s vision to introduce chess at a very early age and the benefits of this decision is for all to see at Agasthya Vidyanikethan. 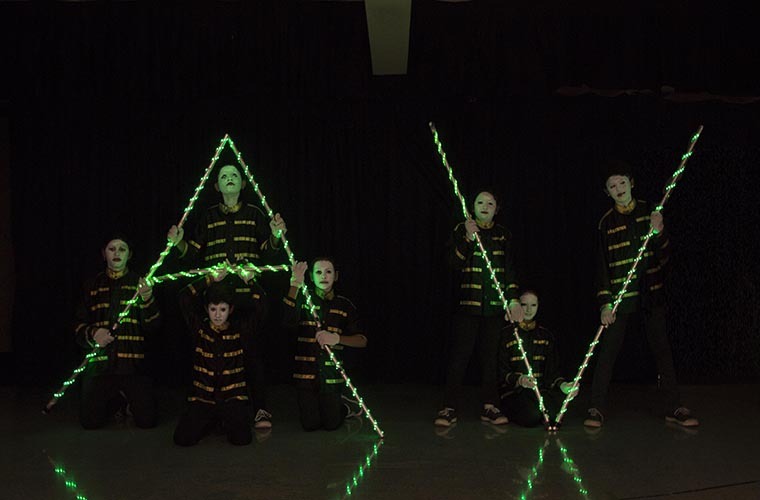 In a word addicted to technology, theatre provides an outlet for making creative choices, thinking new ideas, and interpreting the material in expressive ways that are the essence of theatre and drama. Acting roles from different situations, time periods, and cultures promotes compassion and tolerance for others.Theatre combines the creative ideas and abilities from all its participants. Playing, practicing, and performing develops a sustained focus of mind, body, and voice which helps with other areas of life including school. Drama enhances verbal and nonverbal expression of ideas. It improves voice projection, articulation, fluency of language, and persuasive speech. Students learn to communicate the who, what, where, when, and why to the audience. Theatre brings play, humour, and laughter to learning. The social interaction and risk taking in drama develops trust in self, others, and the process. 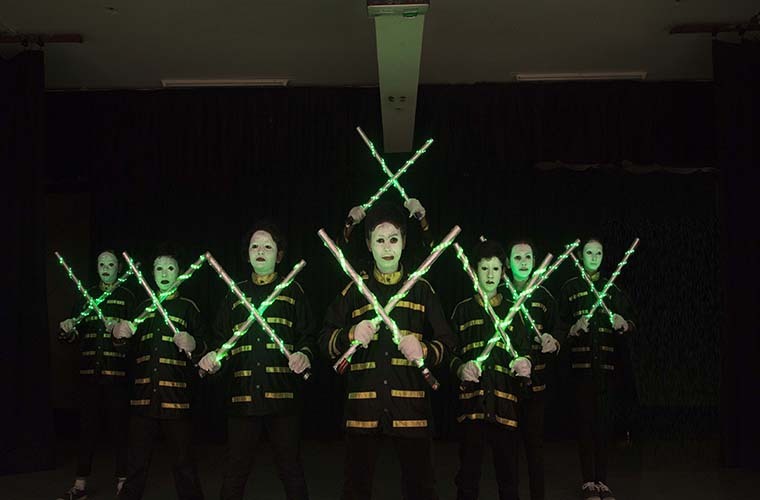 Rehearsing and performing the words, movements, and cues strengthens the memory of each student. Legends, myths, poems, stories, and plays used in drama teach students about social issues. 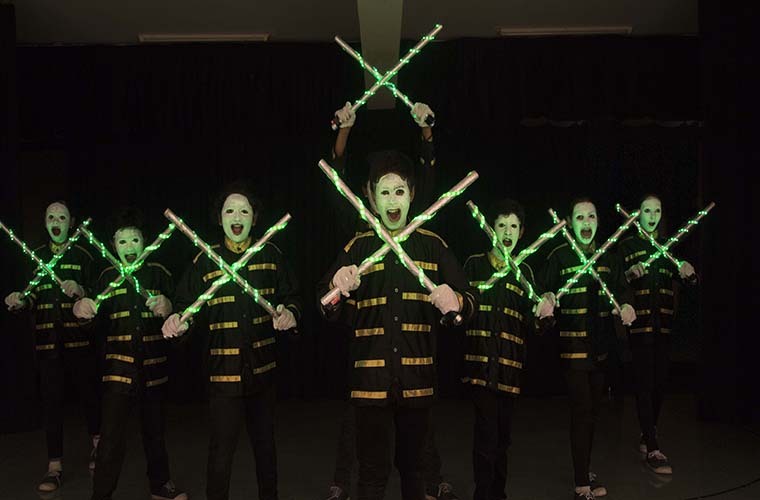 Hence Theatre has always been one of the most cherished co-curricular activity at Agasthya Vidyanikethan.